In the course of the Revolution, Thomas Willcox died, but some time before the war broke out, it was supposed that he had withdrawn from the management of the mills, having turned the business over to his son Mark. It was by him that paper for the first issue of Continental currency authorized by the Congress in Philadelphia, was made more than a year before the adoption of the Declaration. 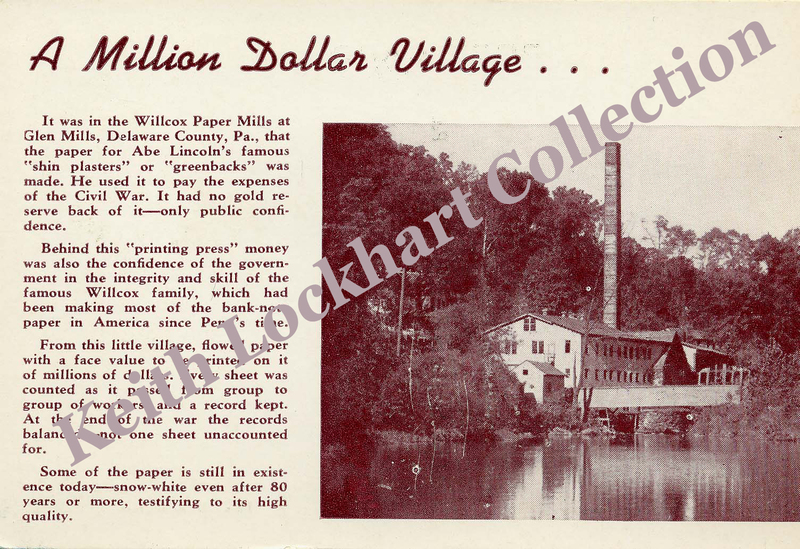 At this time, too, paper of all kinds began to be scarce; subsequently, most of the people had to be severely economical in the use of it, and Nathan Sellers, who made the molds for the process of paper manufacture at the Willcox Mill, long afterward narrated to one of his descendants how fly leaves were torn from printed books and bank leaves from account books in order to obtain material for writing letters. While the British were in occupation of Philadelphia the scarcity was so much felt by the fugitive government of Pennsylvania, then at Lancaster, that a secret order was issued to one of the officers of the army to seize the stock in the mill on Chester Creek. The officer was directed, too, to make particular inquiry as to the conduct of those who were carrying on the manufacture inasmuch as it had been “hinted’ that they were unfriendly to the American cause. The subsequent career of the proprietor, of course, does not justify this suspicion, and the fact that the officer was instructed to certify the quantity of the seized paper because of the intention that he should have a reasonable price, indicates that strong credence could not have been given to the “hint.” Indeed, it seems that while the British were in Philadelphia, Wilcox was arrested by them on the charge of obstructing their officers in obtaining supplies in the country, that he was carried to this city as a prisoner, and that he was afterwards released by General Howe at the solicitation of some of his neighbors who were members of the Society of Friends. He held at various times not a few public offices, including a seat as Associate or lay Judge of Delaware County. It was not only in the Revolution that the mil was a dependency to the Treasury of the national authorities, but also in the War of 1812. At that time, it is stated, a distinctive paper with colored silk woven through it, was made for the government’s use, and that the mill was guarded by the government to prevent the paper from falling into unlawful hands. Again, under Tyler’s administration and it was then that the making of bank paper had come, for some time previous, to be almost exclusively the chief operation of the mill, it supplied the Federal government with the sheets for the printing of its bond issues and also during the Mexican War. When the Civil War broke out it was once more in requisition; Secretary Chase repeatedly made contracts with its owners for the paper on which demand notes, bonds, legal tender notes, certificates and other monetary issues were printed; and it was difficult to produce the material as fast as it was wanted at Washington on some occasions. The late Jay Cooke, when the war was at an end, bore testimony to the value of these services and Chase’s appreciation of them. He stated, moreover, that when peace came, the government concluded that it would itself make the paper for its notes, its bonds and the notes of the national banks, but that the experiment was then unsuccessful and that the authorities were obliged to renew their contract with the men who had through generations of experience in the manufacture of that class of paper. Author David Komarnicki will present his book, Five Stars In The Window, on Tuesday, January 15, 2019 at 7:30pm. Each star on all the flags flown during WWII in the windows of homes of service men represented how many sons, brothers, or fathers were participating in the effort to win the war. David’s journey from that home with 5 stars in the window all happened with a bustling metropolis of Chester during the 1930’s to 1940’s. Imagine for a moment, the hum of the machine that was Chester during that period. A true powerhouse of the manufacturing production, Chester played the main backdrop to the chapters in the author’s early life. A life that included the peddling of the local paper to shift workers who muscled out ships and everything else that Chester built! Come out and experience Five Stars in the Window. A great American Journey. This program is presented free of charge with refreshments served at the conclusion.